Can Sen. Miller grab undecideds? Can Bush harvest more conservatives? Senator Zell Miller’s white-hot convention speech was a tremendous energizer for delegates and spectators alike. People repeatedly jumped to their feet in wild applause as the veteran Georgia Democrat and former governor took Senator John Kerry apart piece by piece, limb by limb. The former Marine from the hill country bordering Georgia and North Carolina revived a form of campaign oratory from the old-school of Southern Democrats. Some bloggers refer to it as Jacksonian. It’s a take-no-prisoners approach. It’s truth telling as he believes it. #ad# Miller has had an extraordinary career. He worked up the ranks of the Georgia Democratic party as state senator, lieutenant governor, state party chairman, governor, and then U.S. senator. With his political skills on full display at the Republican convention on Wednesday night, it was easy to see why he has had such a successful career. A big question is whether or not Sen. Miller’s bravura performance can launch a wave of defections from conservative-leaning Democrats to the Bush camp. It’s also unknown whether or not such a wave can spill over to conservative independents, people who despite the conventional wisdom are still very much in the undecided camp. A fascinating poll authored by Raghavan Mayur, the president of TechnoMetrica Market Intelligence and a pollster for Investor’s Business Daily, strongly suggests that George W. Bush has an electoral problem with conservatives. That’s right — conservatives. According to Mayur’s survey, Bush is now pulling support from two-thirds of self-identified conservatives, which is 15 percentage points less than he claimed in exit polls in 2000. Mayur finds that conservatives make up 29 percent of those who voted in the last presidential election. So if Bush could make up the 15 point deficit, he would pick up 4 ½ percentage points overall — something that would surely give him a decided advantage in this November’s tally. Mayur also finds that conservative Democrats, independents, and even some Republicans are still not ready to cast their lot with Bush. Why not? Well, they don’t think he’s conservative enough. On what issues? Government spending and deficits, immigration, the war in Iraq, and a relatively weak jobs recovery. And — get this — independent conservative women are not sure about Bush’s positions on gay marriage, abortion, and stem-cell research, all of which they strongly oppose. Going back to Zell Miller’s stemwinder on Wednesday night, as effective as the senator was rhetorically, he did not mention spending or deficits or social issues. In fact, not one of the primetime speakers at the convention has done a good job of this. Miller’s most striking success came when he provided new information on John Kerry’s dismal military voting record over two decades in the Senate. The Georgian pointed out that Kerry opposed the B-1 bomber, the B-2 bomber, the F-14A Tomcat, the modernized F-14D, the Apache helicopter, the F-15 Eagle, the Patriot missile, the Aegis air-defense cruiser, the strategic defense initiative, and the Trident missile. This is devastating stuff. It certainly hammers home the point that Harry Truman Democrats should cast their lot with George Bush, not John Kerry. Surprisingly, though, Miller did not mention the late Sen. Henry Jackson, a more recent pro-defense Democratic icon, and the John F. Kennedy tax cuts (Miller himself is a strong supporter of the Bush tax cuts). These oversights are striking as Scoop Jackson and the fiscally conservative JFK are much discussed in Miller’s book, A National Party No More: The Conscience of a Conservative Democrat. But that still leaves an important set of tasks for President Bush. Literally, the whole world will be watching his convention speech Thursday night. In concrete terms, the president must take us through his thinking on Iraq, on the missing weapons of mass destruction, on linking Iraqi freedom and Saddam’s removal with homeland security and safety, on a second-term agenda for taxes, jobs, and the economy, on Social Security reform, on the unfinished items in health and education, and on the social issues of gay marriage, abortion, and stem-cell research. Thus far, the convention has shown the GOP to be a big-tent party. But conservative voters still anchor this tent. The success of Bush’s reelection campaign may well rest on his ability to harvest a bigger crop of conservative votes. 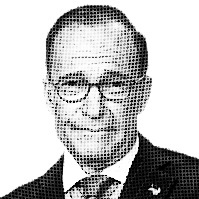 — Larry Kudlow, NRO’s Economics Editor, is CEO of Kudlow & Co. and host with Jim Cramer of CNBC’s Kudlow & Cramer.